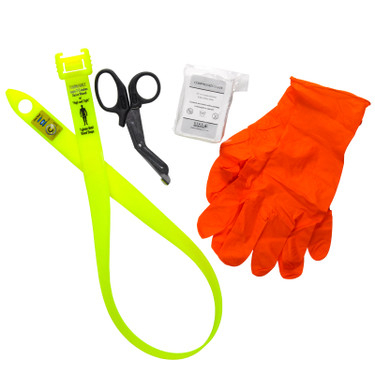 S T A T Medical STAT bleed control pocket kit has the basic supplies you need to address an emergency bleeding situation either for yourself or for a different victim. STAT pocket kit includes a stat tourniquet, a pair of nitrile gloves, a compressed bandage and a bandage scissor packed in a leakproof & airtight Aloksak bag. This pocket pack is lightweight and small enough to carry with you whether you're on the road, at work, traveling or at sporting activities. Total dimensions of this pocket bleed control pack is 8" x 4 1/2" x 1 1/2" and weighs under 1/2 pound. The STAT tourniquet included is one of the easiest tourniquets to use and can be used on limbs as small as 20 mm. Just thread the strap thru, pull up when tight to lock it in place. Integrated timer makes it more convenient to keep track of the time and how long the tourniquet has been on.